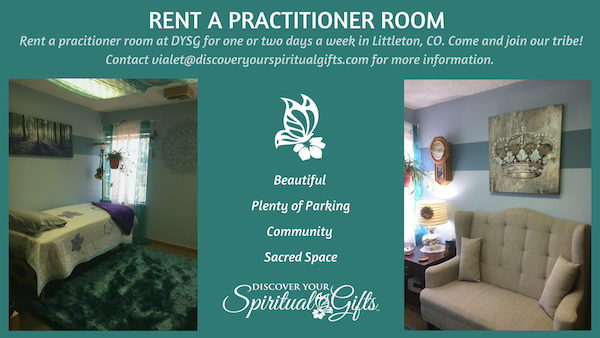 Practitioner rooms available hourly or once a week at Discover Your Spiritual Gifts in Littleton. If you are beginning to work as a reader, you will need a quiet place with privacy for your client. If you are adding card readings to your healing practice, your existing space may be perfect. If you are just starting to read oracle cards, you may have some ideas. Fortunately, there are many places to do readings! Some are free or very affordable, others may be more expensive. New Age Healing Centers often have small private rooms, some of which are suitable for doing readings. A healing center or yoga studio is visited by people who may be interested in your services. Most have great locations and parking, and some have snack bars. Discover Your Spiritual Gifts, Littleton, CO. Practitioner rooms available hourly or one day a week. 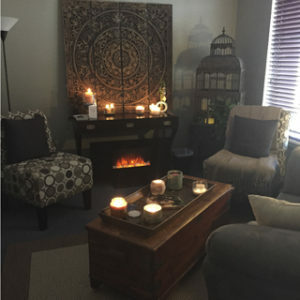 Soul Journey Health, Lakewood, CO. Contact owner for yoga studio and other options. Many private practitioners have wonderful spaces they don’t use during certain hours. Some will rent occasionally / by the hour, while others have a minimum number of hours or a regular time you must rent each week. Most private offices that rent to readers are beautifully furnished, have good parking, and are in excellent locations. Many permit the use of candles or incense. Some may be willing advertise your reading service in their newsletters or websites. You will have to work out arrangements for opening and closing the space, and you may need to sign a contract or leave a security deposit. Talk to individual practitioners to see if their requirements work for you. Elisa Malangone, Arvada, CO. Contact Elisa to inquire about renting her space. Private rooms can be rented for a reasonable fee in many metaphysical book stores. Most are easy to get to, have free parking, and some offer a snack bar for refreshments. Clients can browse for spiritual and metaphysical items. Private rooms in metaphysical book stores often have great ambience, and some will allow candles & incense. A quiet corner of a local coffee or tea shop can be a wonderful place to do readings. Both you and your client can take advantage of refreshments, and most coffee and tea houses have inviting décor and good ambience. If you are able to get a table away from the coffee bar and other clients, you may have enough privacy. Watch out for loud espresso machines, coffee grinders, steamers, and restaurant noise like clatter and other conversations. Most libraries have private rooms dedicated for research and study. Since you and your Seeker are exploring spiritual transformation, it is ethical to use these rooms occasionally for private readings. Contact your local library and make sure to reserve a room with two chairs. Do you have a room you can rent to Transformation Oracle readers? Know of a place that should be on this list?